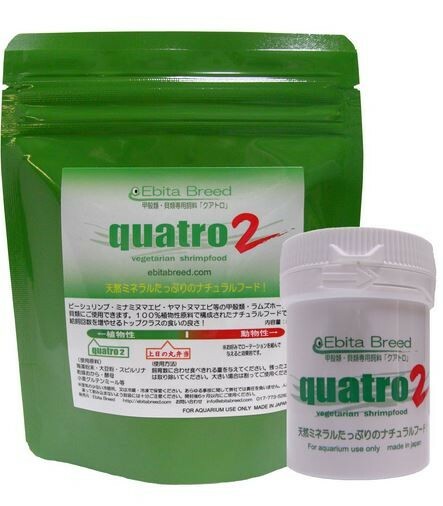 EBITABREED Quatro II is based on the concept of “natural food” which consists of only natural materials and excludes all the chemical additives. We aimed at improving appetite with little influence of established knowledge in dietetics by keeping the minimum nutrition required for crustacean. Its composition is just the opposite to the Hinomaru Bentoh, with considerations that the nutrition required can be supplied by raw materials as much as possible. The mineral of the natural raw materials origin is included in abundance. The color is improved and outer shell strengthened. With improved appetite, the frequency of feeding be increased. 13 kinds of minerals and vitamins, a dietary fiber, 18 kinds of amino acids, nucleic acid(DNA and RNA), cysteine peptide are included.